Ellen (Heidi Schreck) is a freelance journalist of some unspecified sort. It is Thanksgiving, 2000. She and her long time significant other, Danny (Carson Elrod), are about to have Danny’s lesbian sister and her wife (who live on a different floor of their East Village apartment building) join them at Ellen and Danny’s cozy, well worn place. Ellen is enraged at a story on CNN about George Bush’s victory in Florida. Charming Danny is trying to get her to cool it for a while as this is a holiday; he and the other two are worn out on the subject of the Bush election. All concerned share a similar political outlook, but enough of her ranting is enough, he opines. Think Bill Maher does Seinfeld. Dialogue is quick and clever and the sentiments … well, how many people are content with the way that election was conducted? The two Bush elections and his presidency are a significant thread for the two hour and forty minute, eleven scene, saga. Scene breaks are generally heralded by clips of the real events, shown with varying degrees of effectiveness, on the wide screen that frames the set.,. At first it felt oh so comfortable watching “The Wake” unfold, a little like watching Seinfeld. These are my people and they are not talking about “nothing.” It is Okay. Okay, that is, except for the nagging feeling, which kept growing, that any hapless Republican who chanced to be in the audience must be very uncomfortable; also, Ellen’s justifiable (in my mind) tirades became tiresome for us believers in the choir. 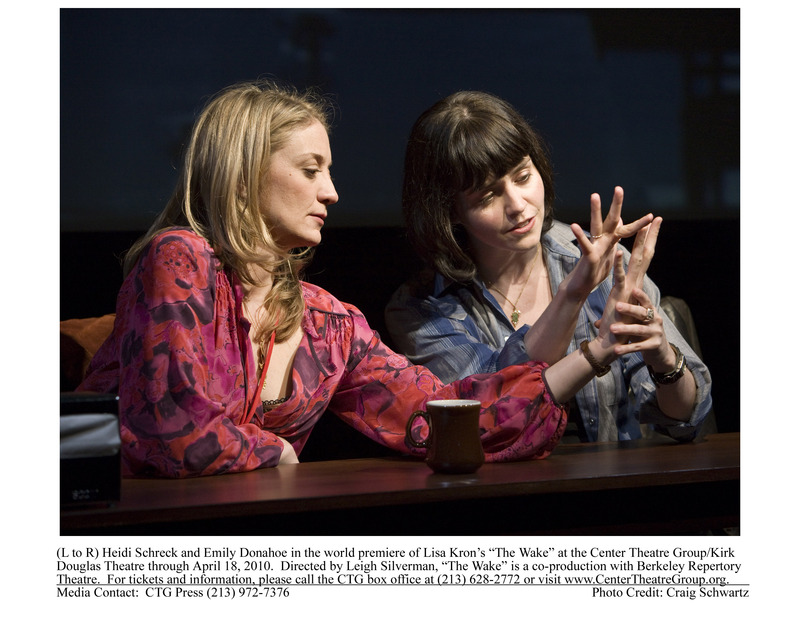 But, then that is one of playwright, Lisa Kron’s. points: obsession, no matter how rational it is initially, is obsession. Ellen carries on to such an extent and with such intensity that she drives a wedge between herself and people who share most of her opinions. Ellen has monologues interspersed between scenes to clue us into her interpretations of her inner feelings. These are not short either. In her first monologue she carries on about “blind spots” and how she thinks she knows what is happening only to run into them. She then says, the “best thing about me is I know what’s irritating about me.” I am not so sure. The supposedly thoughtful monologues are as interminable as the rants. Yes, she knows she keeps dwelling on things with an intensity that burns other people out, but much of her supposed insight strikes me as psychobabble. She is a perpetually smiling and deluded, selfish narcissist who tries to paper over her conflict with others by manufacturing tight little endings that twist the disagreements to appear that she is in agreement. The only person she fools is herself. The dramatic foil to Ms. Cheerful Earful is Judy, a terse, embittered aid worker friend who has returned from another stint in Africa to attend her mother’s funeral. Life has been hard for Judy. Born into poverty, she has pulled herself up and owes nothing to anyone for her success. Spending her career moving from one trouble spot to another she has seen deprivation and strife up close. Her dose of reality is full strength. Amy, the lesbian younger sister of one of Ellen’s high school classmates has carried a torch for Ellen since adolescence. Amy has tracked Ellen down when Ellen is in Cambridge for some sort of pubic appearance. Amy seduces the unwitting Ellen and they have a torrid afaire which loving Danny inexplicably tolerates for over a year. It is only when Danny finally delivers an ultimatum — it is either him or Judy — does Ellen ever experience loss. It takes straight talking Judy to spell out for the sheltered Ellen that the pain she is experiencing is something that real people experience and suffer through as part of life.